Shares the Government of Judea. Eldest son of Herod the Great and of the Idumean Doris, who soon after Antipater's birth was discarded by her husband; born about 38 B.C. ; executed 4 B.C. He was first brought up in obscurity and penury; but Pheroras and Salome, brother and sister of Herod, fearing that the influence of Alexander and Aristobulus, the two sons of Mariamne, would be detrimental to their own designs upon Herod, induced the latter, after the death of Mariamne, to recall to his palace both his former wife and his first-born son. Antipater, with his half-brothers, was then sent to Rome, under the care of Agrippa, to receive an education befitting a prince and patrician (13 B.C.). 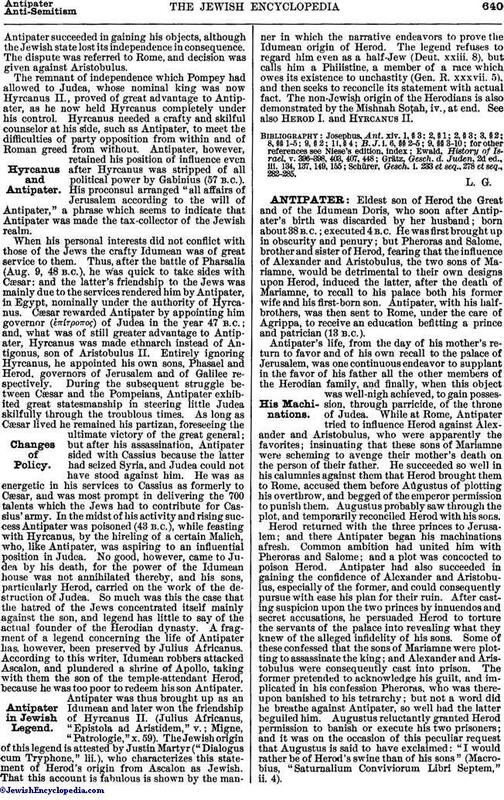 Antipater's life, from the day of his mother's return to favor and of his own recall to the palace of Jerusalem, was one continuous endeavor to supplant in the favor of his father all the other members of the Herodian family, and finally, when this object was well-nigh achieved, to gain possession, through parricide, of the throne of Judea. While at Rome, Antipater tried to influence Herod against Alexander and Aristobulus, who were apparently the favorites; insinuating that these sons of Mariamne were scheming to avenge their mother's death on the person of their father. He succeeded so well in his calumnies against them that Herod brought them to Rome, accused them before Augustus of plotting his overthrow, and begged of the emperor permission to punish them. Augustus probably saw through the plot, and temporarily reconciled Herod with his sons. Herod returned with the three princes to Jerusalem; and there Antipater began his machinations afresh. Common ambition had united him with Pheroras and Salome; and a plot was concocted to poison Herod. Antipater had also succeeded in gaining the confidence of Alexander and Aristobulus, especially of the former, and could consequently pursue with ease his plan for their ruin. After casting suspicion upon the two princes by innuendos and secret accusations, he persuaded Herod to torture the servants of the palace into revealing what they knew of the alleged infidelity of his sons. Some of these confessed that the sons of Mariamne were plotting to assassinate the king; and Alexander and Aristobulus were consequently cast into prison. The former pretended to acknowledge his guilt, and implicated in his confession Pheroras, who was thereupon banished to his tetrarchy; but not a word did he breathe against Antipater, so well had the latter beguiled him. Augustus reluctantly granted Herod permission to banish or execute his two prisoners; and it was on the occasion of this peculiar request that Augustus is said to have exclaimed: "I would rather be of Herod's swine than of his sons" (Macrobius, "Saturnalium Conviviorum Libri Septem," ii. 4). Upon the execution of his sons in the year 7 B.C., Herod nominated Antipater as successor to the throne of Judea, and immediately gave him a share in the government; but, in the fear of a possible discovery of his plots and of a further change in the disposition of the kingdom, Antipater sought to arouse Herod's suspicions against the other two sons, Philip and Archelaus. He sent letters to some influential friends at Rome, requesting them to ask Herod to despatch Antipater to Rome. Herod complied with their request, and sent by him many costly presents to the emperor. Safe now from detection Antipater could more easily prepare the execution of his plots and counterplots. 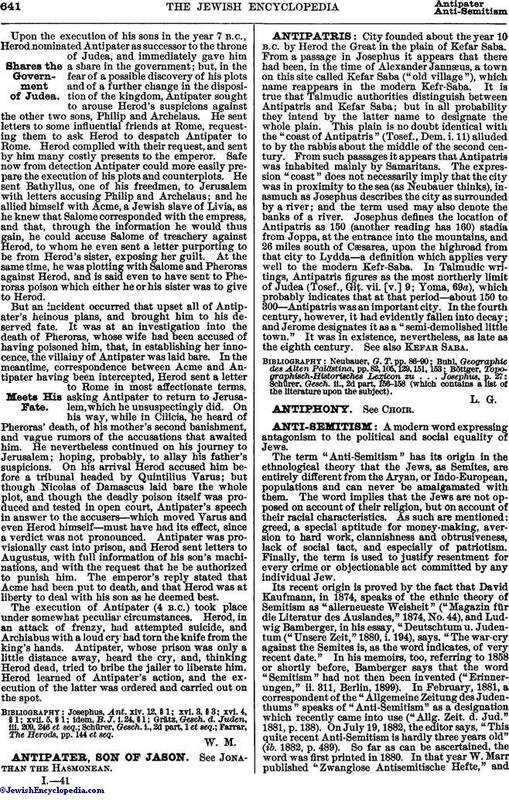 He sent Bathyllus, one of his freedmen, to Jerusalem with letters accusing Philip and Archelaus; and he allied himself with Acme, a Jewish slave of Livia, as he knew that Salome corresponded with the empress, and that, through the information he would thus gain, he could accuse Salome of treachery against Herod, to whom he even sent a letter purporting to be from Herod's sister, exposing her guilt. At the same time, he was plotting with Salome and Pheroras against Herod, and is said even to have sent to Pheroras poison which either he or his sister was to give to Herod. But an incident occurred that upset all of Antipater's heinous plans, and brought him to his deserved fate. It was at an investigation into the death of Pheroras, whose wife had been accused of having poisoned him, that, in establishing her innocence, the villainy of Antipater was laid bare. In the meantime, correspondence between Acme and Antipater having been intercepted, Herod sent a letter to Rome in most affectionate terms, asking Antipater to return to Jerusalem, which he unsuspectingly did. On his way, while in Cilicia, he heard of Pheroras' death, of his mother's second banishment, and vague rumors of the accusations that awaited him. He nevertheless continued on his journey to Jerusalem; hoping, probably, to allay his father's suspicions. On his arrival Herod accused him before a tribunal headed by Quintilius Varus; but though Nicolas of Damascus laid bare the whole plot, and though the deadly poison itself was produced and tested in open court, Antipater's speech in answer to the accusers—which moved Varus and even Herod himself—must have had its effect, since a verdict was not pronounced. Antipater was provisionally cast into prison, and Herod sent letters to Augustus, with full information of his son's machi-nations, and with the request that he be authorized to punish him. The emperor's reply stated that Acme had been put to death, and that Herod was at liberty to deal with his son as he deemed best. The execution of Antipater (4 B.C.) took place under somewhat peculiar circumstances. Herod, in an attack of frenzy, had attempted suicide, and Archiabus with a loud cry had torn the knife from the king's hands. Antipater, whose prison was only a little distance away, heard the cry, and, thinking Herod dead, tried to bribe the jailer to liberate him. Herod learned of Antipater's action, and the execution of the latter was ordered and carried out on the spot. Farrar, The Herods, pp. 144 et seq.